I'm chipping away at my Christmas Craft To-Do List, but I couldn't wait to show you this completed project. It almost took me longer to stuff the insert in than it did to make the pillow. I considered using socks for the stocking or cutting them out of felt, but then I saw these on sale at Target this week. 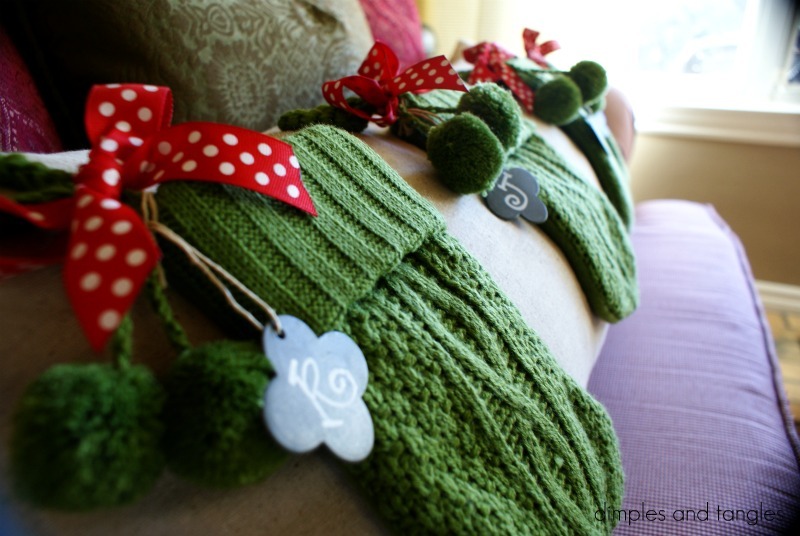 They are cable knit just like I pictured in my mind, my favorite color green, mini-sized...perfect! Look at those pom-poms. How cute are they? My son was excited to discover that they were real stockings, and is looking forward to the possibility of finding some candy in his! I hand-stitched on the stockings and made a quick pillow cover with an envelope back, and then added the bows and initial tags after it was stuffed. By the way, do you know the ribbon trick so cut edges won't fray? I sure didn't until I started reading blogs! With most cut ribbon, you can hold the edge very close to a flame from a candle or lighter to seal the edge. Don't get too close or it WILL catch on fire, just close enough until you see the edge start to melt a bit. I usually always do this over the kitchen sink just in case. This little tip has saved me so much grief in ribbon crafting since I started using it! I had everything except the stockings, so $16 wasn't too bad for this little project. Even my insert was free...my sister gave me some down pillows that they couldn't use because of allergies. I took them apart and stuffed the feathers into a custom sized sleeve that I made from extra black-out drapery lining. I learned the hard way to use something like that-it's thick enough that the feathers don't poke through the fabric. My inspiration pic definitely has it's own look, but I enjoyed adding my own preferences to my version. I'm linking up with Hi Sugarplum! and Debbie Doo's Holiday Copycat Challenge. Come see some other great Christmas crafts. SO cute!!! LOVE them in the green!!! This is adorable! I saw those cute little stockings and wondered what I could use them for.. :) Great job! Pottery Barn should have consulted you! They're so fun & festive! You are one talented mama!! so so cute!! I'm crazy for those little socks! thanks for linking up! Perfecto! 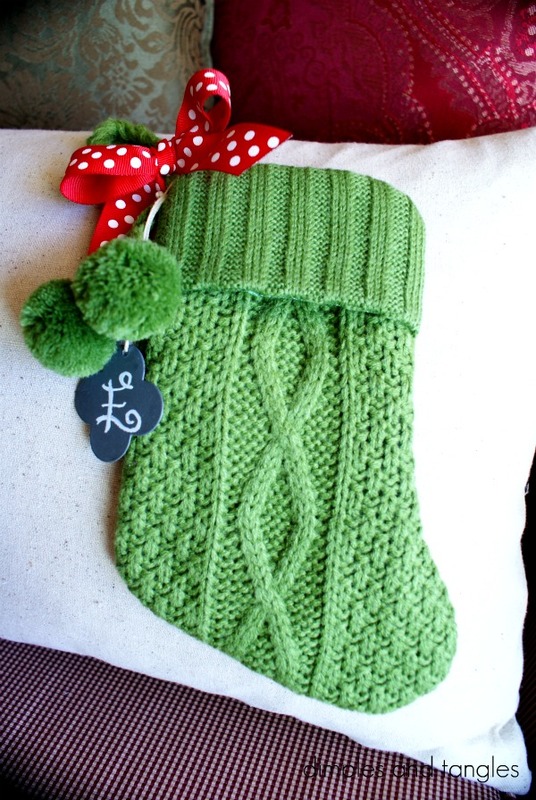 I can't believe you made the little stockings yourself, they are so cute. You did a great job and I am glad you shared it with the holiday copy cat party. Oh my goodness! This is adorable! I, too, like yours even better! The red and green is so festive. Awesome job!!! I LOVE your version! 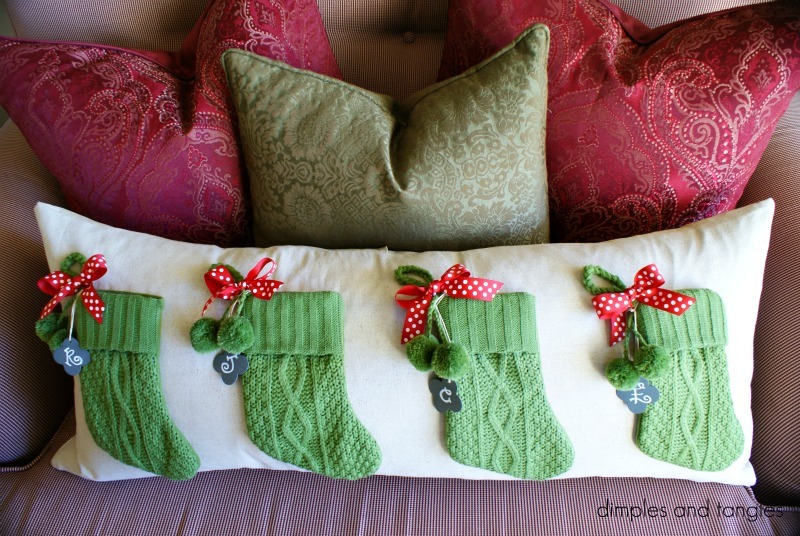 I want to make a stocking pillow for the bench in my entry. Thanks for the inspiration! 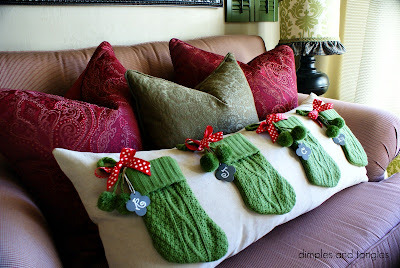 I love this~ the pillow is a great copy, and the green mittens are adorable! I am linking from Debbiedoos. I'd love for you to link up this or any other Christmas projects to my first ever Holiday party!! I love it! Using mini stockings was a stroke of genius - add me to the list of folks who like yours better than the original! Adorable! I like your colorful version better than the $49 Pottery Barn version! I LOVE this! So much! omigosh,,,,,,,this is the cutest thing EVER!!!!! Your version is so much CUTER ! I love it so much, I'm going attempt my own version! That is really a very good idea to decor the feather pillows covers. I think these design are perfect for the toddlers pillows as the kids always like such kind of designs for fun. Thanks for your fantastic share!! !